This stylish gamepad is designed for comfortable use. With vibration control and optimized precision, this product is an optimal choice for real-time gaming. 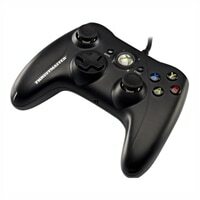 ThrustMaster GPX - Gamepad - wired - for PC, Microsoft Xbox 360This stylish gamepad is designed for comfortable use. With vibration control and optimized precision, this product is an optimal choice for real-time gaming. Refined ergonomics for optimal comfort and handling with non-slip grip on the entire lower surface for enhanced handling and comfort. Low-frequency vibration motor on the left, and high-frequency motor on the right let you feel distinct feedback effects in games, on either the left or right-hand side. A big advantage in real-time gaming. Optimized precision thanks to 2 non-slip mini sticks clad in textured rubber for optimal handling and comfort. Precision is guaranteed thanks to optimized resistance pressure.